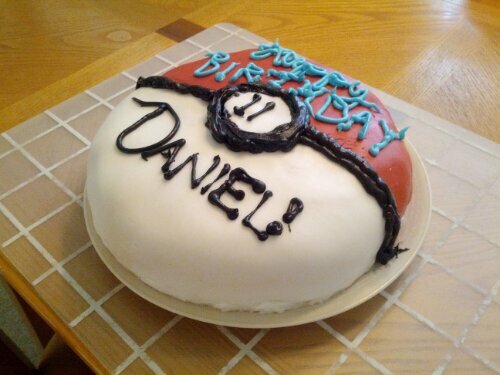 My stepson decided he wanted a Pokemon birthday this year. 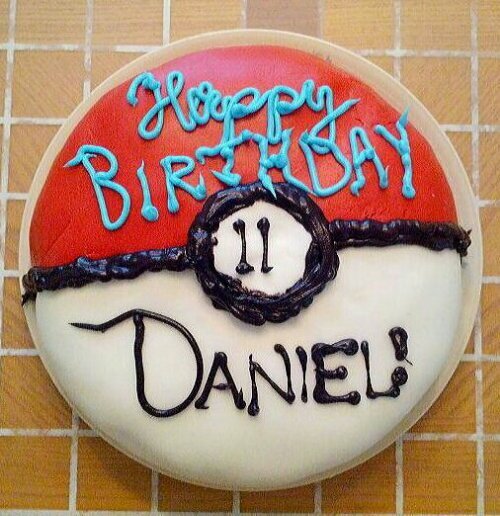 The Pokemon figures are pretty hard to make into a cake so I decided to make the Pokeball, which is just a round ball, half red & half white. I’ve been wanting to try my hand at decorating a cake with fondant after washing billions of hours of Charm City Cakes’ amazing creations and ‘the Cake Boss’. Obviously this would not be anywhere in the same league as the cakes they create, but you have to start somewhere, right? I have to say that even after making the fondant, I was still surprised at how heavy it was when it came down to decorating the cake. It’s not like pie dough where you can roll it onto itself and move it. You actually need to decide ahead of time to bring the cake closer to you. I found this out after having finally kneaded the fondant so it was just right and then rolling it to just the right thickness and then trying to get it to my cake… And having it rip apart and fall on the floor… Thus having to start all over with a new piece. And I did this TWICE before moving the cake. Ugh. Sometimes my brain doesn’t work! Anyway, once I moved the cake and got a feel for the fondant, it went pretty smoothly. Then I went to add the final touches, which I thought would be the easiest part… I had that icing in a can with the writing tips. That’s what I used for the black lines I needed. It came out in globs and made a mess. Then I tried to ‘fix’ it by making another line so maybe it would look like it was supposed to be thicker. It looked awful! Oh well. It was black, it’s not like I could take it back off and start over (the fondant instantly took on the color!). I decided to just be happy the fondant worked. But then, because I can’t just leave well enough alone, I had to write on the cake. I used that same icing in a can, this time in blue. Maybe it’s just me. I don’t think I can write on cakes. The writing was awful and I was very upset about it. I do have a really nice set of cake decorating tips so next time I’ll see if I can do any better with the decorations using homemade icing. The actual cake was just a white box cake, I made a blue and a green layer and then I cut each layer in two so it would be a 4-layer cake. I made a delicious vanilla buttercream to frost it. I also added a layer of sprinkles :). I wish I could post a pic of the inside but it was so late after trick-or-treating last night, it never got cut! I think I’m going to go eat the leftover vanilla buttercream!